The Institute of Physics have created a short guide for post-16 students who are considering studying physics at university. The guide talks about career prospects, degree entry requirements, course content and also offers advice on choosing a university. Over many centuries physicists have developed ways of understanding reality, from the tiny to the enormous, the freezing to the fiery. Their quest? To explain of all nature with just one set of rules. It’s been a long journey, with many dead ends and setbacks. But some are hoping we’re nearly there. Why String Theory is a website set up by by Edward Hughes and Charlotte Mason in Summer 2012 at the University of Oxford. The project was funded by the Royal Society via Dr Joseph Conlon’s University Research Fellowship. Dr. Joseph Conlon, Charlotte Mason and Edward Hughes wrote the articles. The website is aimed at a general audience. The website motivates string theory and why scientist are interested in it. The website assumes no prior knowledge of advanced mathematics or physics. Barton Zwiebach, A First Course in String Theory, Cambridge University Press, 10 Jun 2004 – 578 pages. Richard J. Szabo, An Introduction to String Theory and D-Brane Dynamics, Imperial College Press, 2004 – 128 pages. Joseph Polchinski, String Theory: Volume 1, An Introduction to the Bosonic String, Cambridge University Press, 2 Jun 2005 – 424 pages. Mark Trodden (University of Pennsylvania) is a regular science blogger via his contributions to Cosmic Variance, a blog hosted by Discover magazine. In an audio interview with Physics World (link below), discusses blogging and the challenging issues one needs to address. CALL it the Higgs boson effect, the Big Bang Theory effect or even the Brian Cox effect, if you must. There’s no getting away from it – after years in the doldrums, physics is cool. Nathan Shields eats maths for breakfast! Nathan Shields has been very creative with his breakfast, making pancakes that resemble fractals. Above is the tastiest I have ever seen. Compare it will the image below. 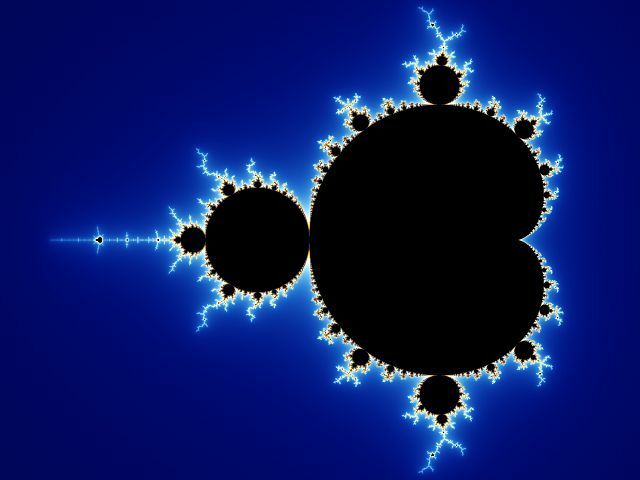 Other examples can be found via the American Mathematical Society website here. Above is a picture of a rock taken by the Mars Hand Lens Imager (MAHLI) on board NASA’s Curiosity rover. The rock has been called “Jake Matijevic” by the team in commemoration of influential Mars-rover engineer Jacob Matijevic (1947-2012). The above image shows the robotic arm of NASA’s Mars rover Curiosity with the first rock touched by an instrument on the arm. NASA’s Hubble Space Telescope has produced an image of galaxies going back almost to the time when the first stars began to shine. 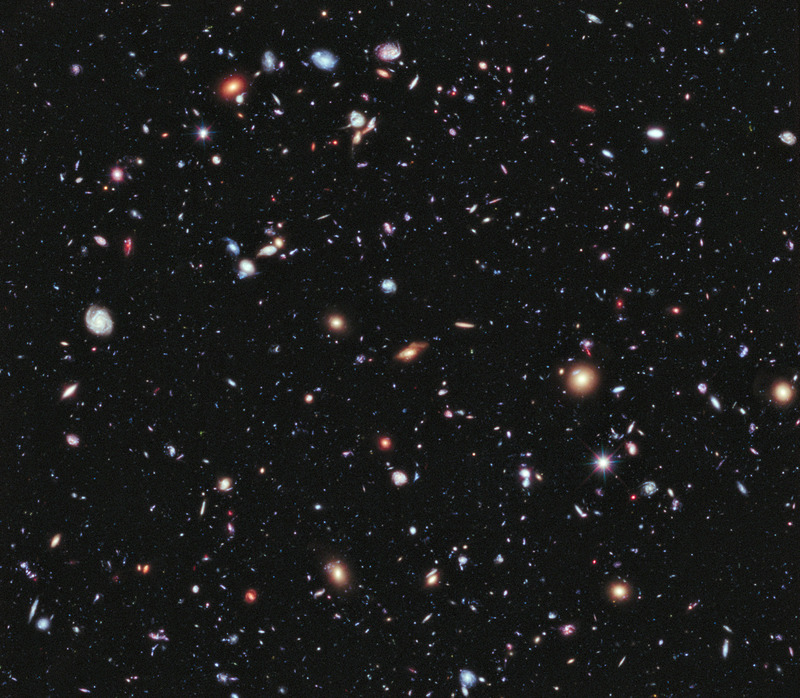 The image shows galaxies as old as 13.2 billion years. The Universe is about 13.7 billion years old. 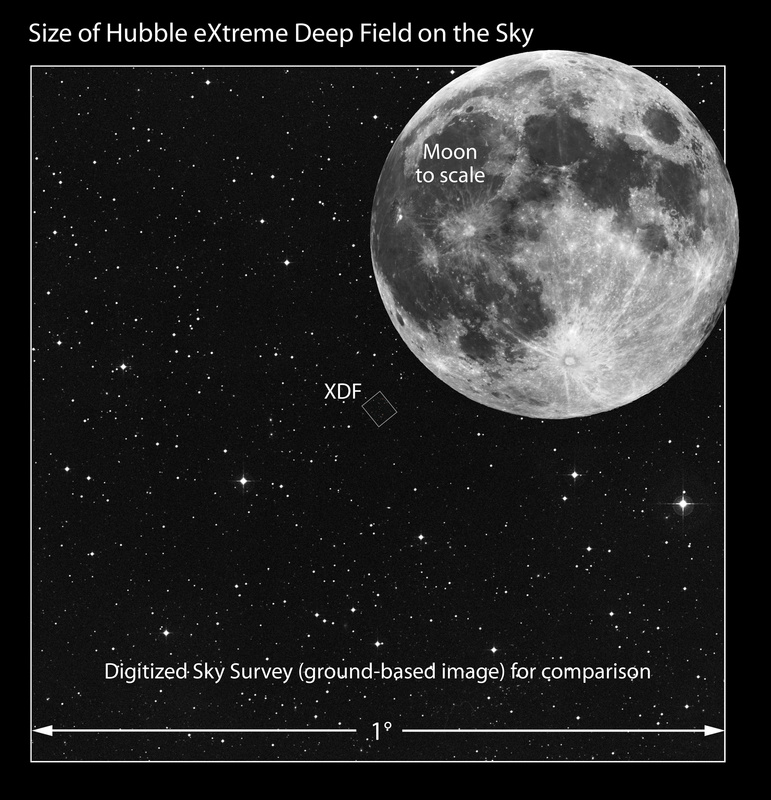 The image is of a small patch of sky, only a small fraction of the angular diameter of the full moon, located at the center of the original Hubble Ultra Deep Field. 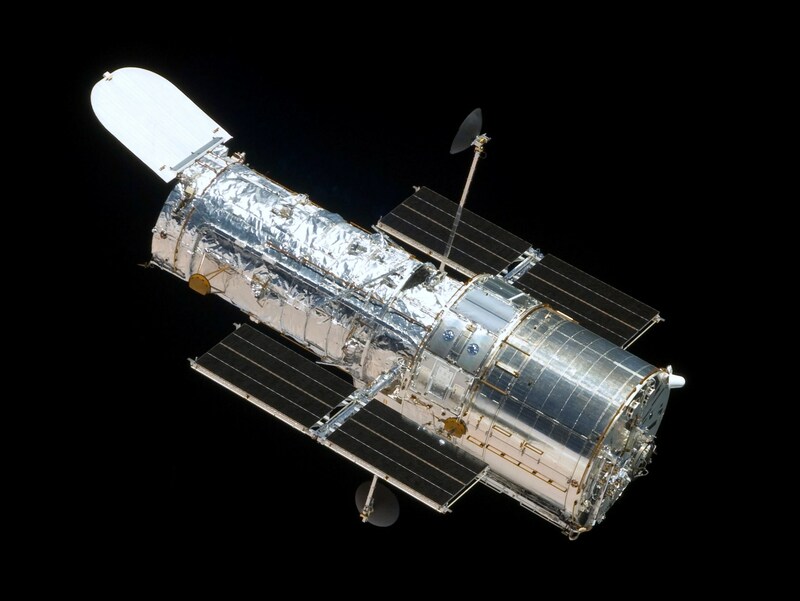 The photograph was assembled by combining 10 years of Hubble Space Telescope photographs, which amounts to more than 2,000 individual images. The above image gives you an idea of the angular size of the image. For more details consult NASA’s webpages. Joseph Keller (US), Raymond Goldstein (US/UK), Patrick Warren and Robin Ball (UK) have been awarded the 2012 Ig Nobel prize for physics for calculating the balance of forces that shape and move the hair in a human ponytail [1,2]. The winners were announced and awarded on Thursday 20th September. Anyone interested should examine the Ponytail Equation. Raymond E. Goldstein, Patrick B. Warren, and Robin C. Ball, “Shape of a Ponytail and the Statistical Physics of Hair Fiber Bundles.” Physical Review Letters, vol. 198, no. 7, 2012. Joseph B. Keller, “Ponytail Motion,”, Journal of Applied Mathematics, vol. 70, no. 7, 2010, pp. 2667–72. 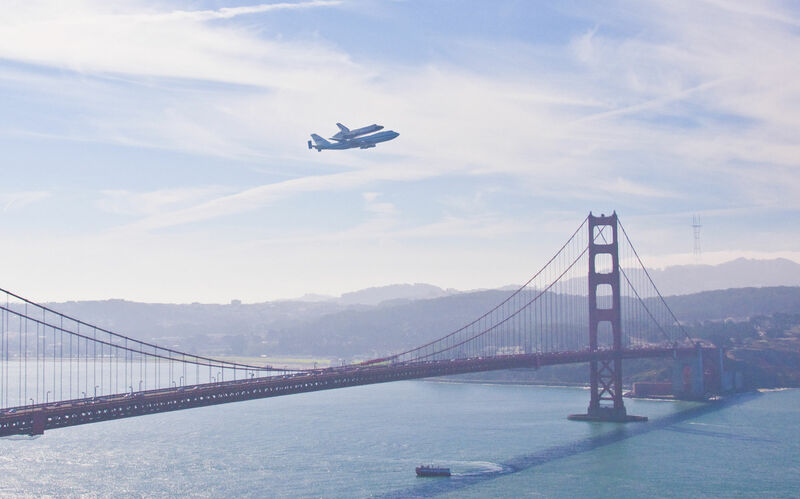 The Endeavor making a fly by over the Golden Gate bridge. The craft was carried “piggyback” on NASA’s Shuttle Carrier Aircraft, a Boeing 747 specially outfitted. 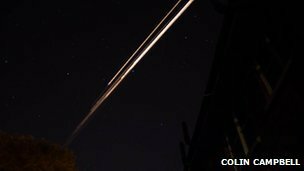 Last night people across the UK saw bright objects in the night sky. The police in north-east were contacted by concerned members of the public reporting sightings of UFO’s lighting up the night sky. It is thought that the “light display” was due to space debris burning up in the atmosphere. The timing, the brightness and colour of the meteors suggest that they were not part of the expected natural meteor showers.